We theorize children’s emotional relationships with place in terms of love, care, and solidarity, drawing upon Lynch (2007). However, rather than restricting emotional relationships to human-human interactions, we extend the relational and emotional other to the more-than-human world and to place itself. Can children situate themselves as interdependent beings with other living and nonliving entities in place? Can they come to understand that they are not separated from “nature” but are part of “nature,” emotionally interconnected with the living systems of Earth? 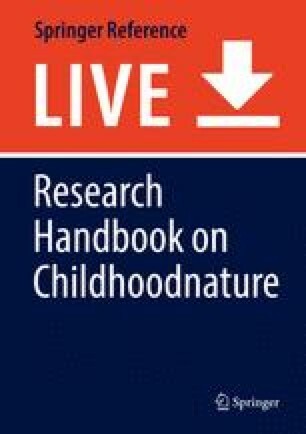 To investigate children’s emotional relationships with place and the more-than-human world, we analyzed their representations of “nature” and themselves following an excursion to Karawatha Forest in South-East Queensland, Australia. The children were 11–12 year-old (in Year 6 or 7) and attended four different primary schools in the Brisbane area. The excursion was based on a place-responsive pedagogy that followed the story of Bernice Volz, whose civic action in the 1990s was crucial for establishing Karawatha Forest and lagoons. Ron Tooth and other staff at Pullenvale Environmental Education Centre (PEEC) designed a storythread educational program for Karawatha that situates Bernice’s story as pivotal in mediating children’s experiences. Their connection to place is also mediated throughout the excursion by dadirri, an Aboriginal practice of attentiveness to, and feeling in place. Following the excursion, children shifted toward an understanding of “nature” as agentic, knowledgeable, emotional, and not as separate but as bonded to them. They envisaged relationships of love, care, and solidarity with “nature” in the present and future, and for some the excursion marked a significant change in identity. The implications of this place-responsive pedagogy are considered in the context of neoliberal times and accountability pressures for teachers. Ungunmerr-Baumann, M. R. (2002). Dadirri: A reflection by Miriam-Rose Ungunmerr Baumann. Retrieved from http://nextwave.org.au/wp-content/uploads/Dadirri-Inner-Deep-Listening-M-R-Ungunmerr-Bauman-Refl.pdf.